I have had several requests for this dish, so I decided to post the recipe. Apparently it was a favourite with American servicemen stationed at Keflavik airport and some of them still remember it fondly. 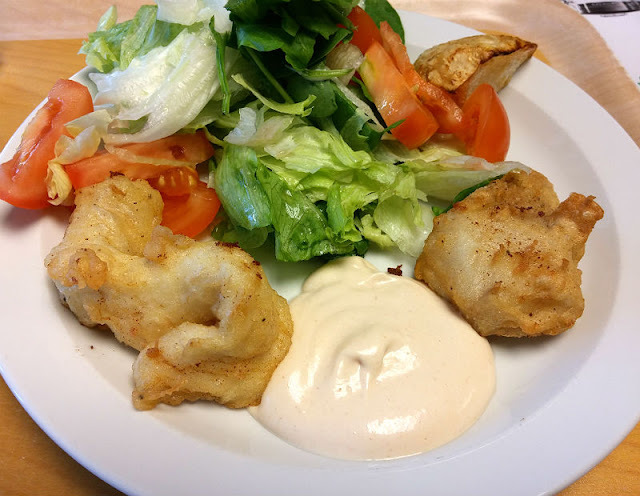 I'd be the first to admit that this isn't a specifically Icelandic dish, but you can buy it in many diners and restaurants all over the country. Mix together the lager or water, sugar, salt oil and egg yolk and thicken with flour until the batter is the thickness of pancake batter. Let stand for 1 hour at room temperature. Whip the egg white stiff and fold into the batter just before you use it. May be used to coat fish, scampi/langoustines, shrimp or vegetable fritters. Cut the fish fillets in pieces about 3 by 2 inches. Pat the fish pieces dry, season if you wish and dredge in flour. Dip to coat in the orly batter and fry in a frying pan or a deep-fryer (set temperature at 180 to 200 °C (355 to 390 °F)) for 2-3 minutes. Batter coating should be golden when cooked. Generally served with chips/fries, cocktail sauce and coleslaw. I also like to serve it with rice, salad and sweet-and-sour sauce. Stir peeled Arctic shrimp or finely chopped vegetables into the batter and drop lumps of it into hot oil with a tablespoon. Makes great finger food. Cut fish fillets into finger-sized strips, batter and fry. Another great finger food. Cocktail sauce, garlic sauce, sweet-and-sour sauce or sweet chili sauce make a good dipping sauce for food in Orly. First rate!!!! For a change chop scallops into the batter abd wrap large prawns with green onions before dipping. I understand why people would request for this recipe, it's just great! Please post more fish recipes like this! My husband and I were stationed in Keflavik in 1986. The USO had a fish fry every Friday night. I keep looking for a recipe that is close to it. I can't wait to try it. Good luck. If it turns out to be not exactly the right flavour, it may be a matter of adding the right spices. its realy a awsome fried fish dish .i never had like this orly style fish .